If you have a large area of grass to mow, you need a Swisher Trailmower! Backed by the power of 60+ years of design experience, the Swisher 60" 14.5 HP Trailmower is designed to dramatically reduce mowing time. The Swisher Trailmower attaches to ATV's, lawn tractors, and any utility vehicles to cut large lawns and meadows fast. Three blades are powered by a 14.5 horsepower, Briggs and Stratton engine for a finish-cut quality, each and every mowing. A 60 side-discharge cutting deck cuts wide swaths and spreads the grass out to avoid choking. Cutting-height adjustment handles are easy to control for just the right cut. This Swisher is equipped with a handy 12-volt key starter, so firing up the mower is a snap, rather than a big workout. The Ariens Razor Walk Behind Lawn Mower will provide your yard with professionally manicured results in a snap. Packed with innovative features, this mower includes the exclusive Rite-Hite handlebar adjustment that allows for simple adjusting of the handle from the operator position by pushing the bail forward. Plus, you can easily select one of 7 cutting heights with the single point height of cut adjustment feature. The Razor Walk Behind Lawn Mower also includes a 3-in-1 system that makes it easy to quickly transition from mulch to bag to side-discharge. 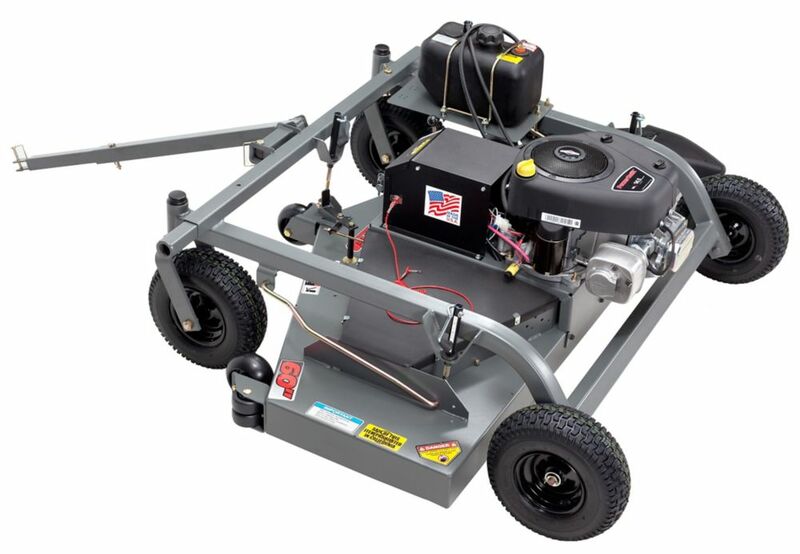 And, the mower's deep domed deck design provides excellent performance in all cutting modes. This 18-inch Corded 2-in-1 Electric Mower features a 12 amp, 120V system and a design that lets you mulch or side-discharge in a single tool. The mower's single lever height adjustment moves all wheels at once within a 1 3/4-inch to 4-inch cutting height range. A special cord hook helps manage the cord. MTD walk behind mower: blower attachment. Blows grass clippings, leaves and other debris from driveway and sidewalk. Fits MTD 21 inch walk behind lawnmowers with spring loaded side discharge and mulch door, 2009 & after. Installs safely and quickly - no tools required. Easily attaches to lawnmower handle when not in use. 60-inch 14.5 HP Tow Behind Grass Mower If you have a large area of grass to mow, you need a Swisher Trailmower! Backed by the power of 60+ years of design experience, the Swisher 60" 14.5 HP Trailmower is designed to dramatically reduce mowing time. The Swisher Trailmower attaches to ATV's, lawn tractors, and any utility vehicles to cut large lawns and meadows fast. Three blades are powered by a 14.5 horsepower, Briggs and Stratton engine for a finish-cut quality, each and every mowing. A 60 side-discharge cutting deck cuts wide swaths and spreads the grass out to avoid choking. Cutting-height adjustment handles are easy to control for just the right cut. This Swisher is equipped with a handy 12-volt key starter, so firing up the mower is a snap, rather than a big workout. 60-inch 14.5 HP Tow Behind Grass Mower is rated 2.6 out of 5 by 8. Rated 1 out of 5 by Nate from The first mow with this was GREAT!!! Then after about 1 week I went out to mow with it again and ... The first mow with this was GREAT!!! Then after about 1 week I went out to mow with it again and it wouldn't turn over. Checked battery voltage and it read 12.87VAC I thought to myself well that should turn this thing over pretty easily. Nope it sure didn't. I went to tracing wires to hopefully find something that wiggled itself loose and came across a solenoid that is attached to the float bowl on the carb. That solenoid was very hot to the touch. Why are components failing on a unit that only has been ran for a MAX of 3 hours? Rated 5 out of 5 by Bill from Excellent buy I am extremely happy with my Swisher mower, it does the job much better than expected. I am also happy with Swisher for their service. The starter solenoid went bad after just a couple starts. I understand that mechanical issues happen, but Swisher handled the issue very professionally. They sent a new solenoid out under warranty, and I was back up and running in no time! Rated 1 out of 5 by Anonymous from Flimsy The factory belt lasted about an hour! Had problems with the belts ever cents. The towing arm has broke twice. Very poorly built machine. I have two other tow behind which I've never had any problems with and the last four years. Rated 1 out of 5 by HomeDepotCustomer from Junk doesn't cut well at all. adjustment handels fall off, towing arm is bent. How can I return this item.